Audi says its new A8 is the first production car with Level 3 autonomy. 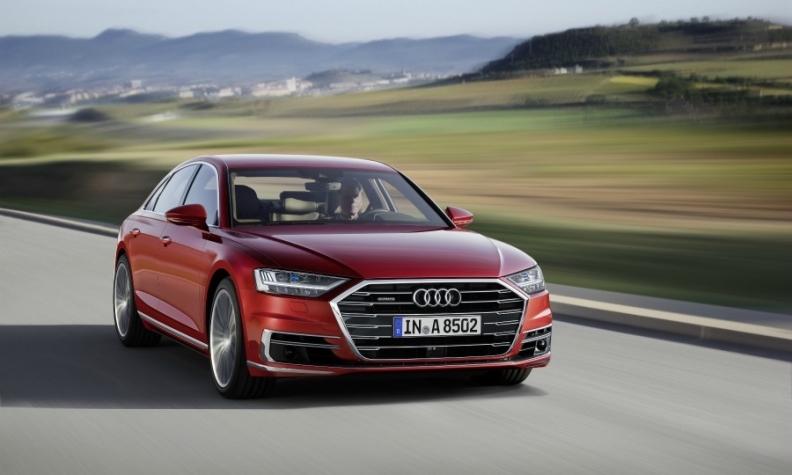 The Level 3 autonomous driving technology in the new Audi A8, which will be on display at the upcoming Frankfurt auto show, has some interesting highlights. That was my takeaway after getting an in-depth look at how Traffic Jam Pilot works. First of all, it only functions on two-lane highways separated from oncoming traffic by some physical barrier. When the car’s brain, the zFAS motherboard, decides the circumstances are right for autonomous driving, the frame around the digital instrument cluster will glow white, indicating it’s safe to activate the Pilot, which can be done at speeds of up to 55 kph by pressing a button near the gearshift marked, Audi AI. The frame then turns green to signify the vehicle is operating itself. Similarly, in the event that one or more sensors failed, engineers at Audi decided the best course of action would be to request the driver re-take control, disabling the function until the defect is repaired. If the driver doesn’t grab the wheel with both hands, the frame flashes red and a message appears on the display. Assuming there is still no reaction after about 10 seconds, the seat belt tugs several times increasing its force in an attempt to get the attention of the driver, before the car briefly applies the brakes gently several times to jolt the driver. If all the warnings fail to get the driver to take back control, the system slows the car down to a complete stop. Should the driver still not react, an emergency call is made. Here is how Audi has addressed several other potential problems. Should ice form on the lidar there is a heater that can melt it away. The monolens camera can use the windshield wipers to clear any dirt away. If the sensor suite lose power from the 12-volt supply, electricity is rerouted from the 48-volt system with the help of an AC/AC transformer. Should the 48-volt system lose power, the vehicle can continue to operate itself using the sensor data. If the brakes to fail, there is a backup there as well. Assuming the electromechanical brake booster hooked up to the 48-volt system dies, and the driver doesn’t hit the brake pedal, then braking pressure can be created through a hydraulic pump in the electronic stability control system, which uses the 12-volt supply. If the zFAS itself stops working, that would also result in the loss of data from the camera and the ultrasonic sensors. In that case, the the system can still fuse the data from the five radars and the lidar so that the car is not blind when judging when to come to a stop. This should ensure that at least two of the three main sensors (lidar, front camera and radar) are always working so that the car can come to a stop without posing a risk to traffic in its lane. If all three fail, the car will come to an abrupt stop since it can no longer look ahead. How this problem might be solved in a more advanced version where speeds are higher and the vehicle would not simply be following the one directly in front of it remains to be solved for another day. Here are some of the key components and suppliers behind the Traffic Jam Assist. zFAS – Produced by Delphi and located under the driver’s seat, it features four processing chips. The Nvidia Tegra K1 is used for a 360-degree surround view of the vehicle for maneuvering in tight spaces with the help of four tiny fish-eye cameras. The other three are responsible for autonomous driving: the Mobileye EyeQ 3 computes data from the front camera while another, an Altera Cyclone V chip with an integrated ARM processor, is used for most of the sensor data fusion. Lastly, an Infineon Tricore chip is responsible for making and executing decisions such as planning the vehicle’s trajectory and speed. 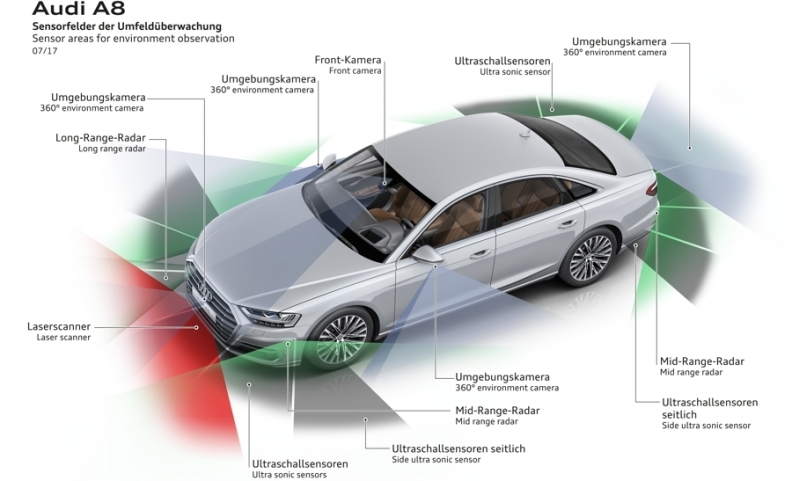 Lidar – Developed by Audi and produced by Valeo, the A8’s laser scanner is capable of precisely measuring its environment. Found right below the front license plate, it has a 145-degree opening radius and four different vertical layers to create a 3-D model of its surroundings. Front camera – Unlike the more expensive Bosch stereo cameras supplied to Mercedes that can precisely capture both motion and depth, this the A8’s solution has only one lens and requires “optical flow” algorithms to predict an object’s movement and its spatial relation to the vehicle. Image mapping and recognition software are powered by Mobileye’s EyeQ 3 processing chip. Long-range radar – Supplied by Bosch, this system is near the center of the grille and uses radio waves to scan roughly 250 meters ahead. Short-range radar – Supplied by Delphi, there are four sensors positioned on every corner of the car. Each has a wide opening angle of about 180 degrees.